Jeans! Whether you’re dressing them up or down, they’re everyone’s favorite closet staple. And, while they’re always good just as they are, sometimes it’s fun to change things up. Feeling a denim #refresh? Try out these three styling tricks to bring newness to your old closet staple. Watch Stylist Alexandra O. as she shows you how to cuff your jeans! Hi everyone, my name’s Alexandra and I’m a Stylist here at Stitch Fix. I’m here to teach you how to cuff your jeans, so we’re going to go through three awesome cuffs and the best jeans to do them with. (00:13) The three best types of jeans to cuff are your skinny, straight and boyfriend jeans. Why are you cuffing your jeans? 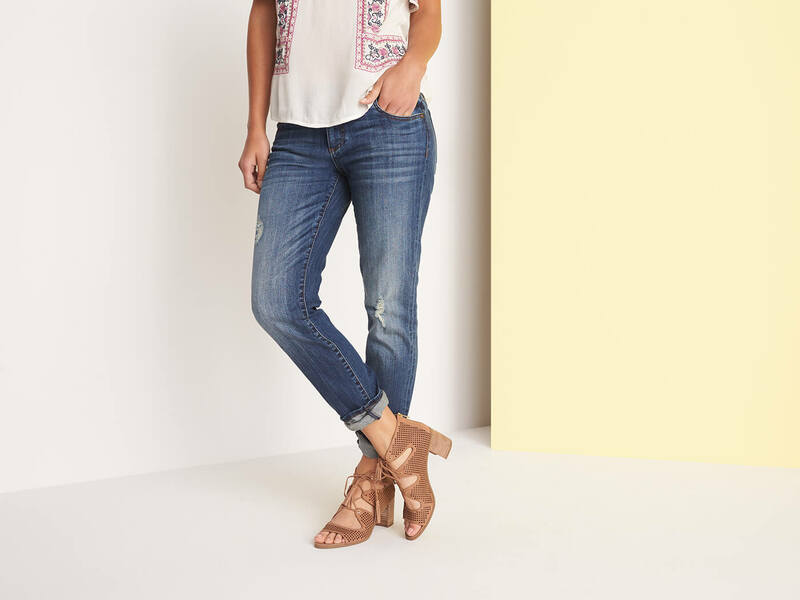 A cuff will highlight your favorite summer sandals or you might not be ready to go to the tailor just yet or maybe you want to breathe some new life into an old pair of jeans. (00:36) You can get started cuffing your jeans with the most simple of cuffs: The Fold-over. This is one step and you use your two thumbs to measure. So you’re going to start with your hem down, pick a spot one to two inches where you want the cuff and just fold it over, making sure it’s even with your thumbs and straighten it out. For an intermediate cuff, try the double cuff. 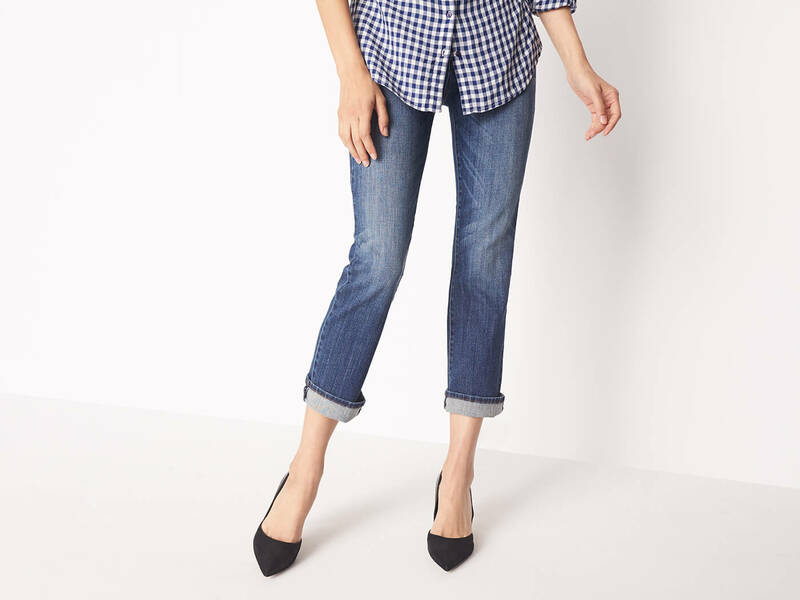 this one’s my go-to for skinny jeans, but works great with a pair of boyfriend jeans or straight legs. To get started, you fold over the stitched hem of the jeans just once. Then make sure your fold is nice and smooth and then double cuff. (01:19) When you’re feeling really confident in your cuffing game, you’re ready for the roll cuff. 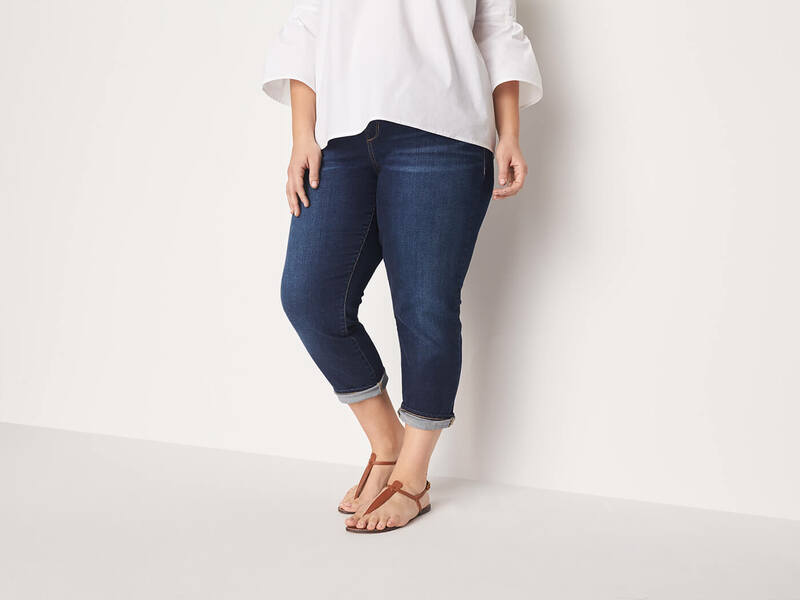 For this one, you’re going to want to start on the outer edge of your jeans and just pinch a little of the side of your hem. From there, you’re going to roll it up and make it as messy and loose as possible for a great downtown, everyday chic look! (01:42) How fun was that? I hope you guys are feeling really confident about your new cuff-abilities so when you’re cuffing this season, be sure to share with us on social and hashtag #FixObsession so we can see what you’re cuffs are looking like. Of course, comment below to tell us what you’re looking for next time! You want to show a little skin and a lot of shoe! Your jeans are a little too long & you want to skip the tailor. You want to liven up a worn-in pair. Keep scrolling to learn how to cuff your jeans! The easiest of the tricks you’ll see today. With an easy flip of your hem, you instantly set the stage for statement shoes and your spring pedicure. Unsure how to make both sides even? Use the knuckle trick (see our editor’s tip below!) to make sure you’re cuffed to perfection. Editor Tip: To get an even cuff, we have one rule of thumb: Use your thumb as a makeshift ruler! First, place your thumb against the hem. Then, simply roll over twice. Need to shorten a pair of too-long jeans? Want a cropped, casual look? Double cuff your denim dungarees! Starting at the hem, cuff your jeans to reach about half the length of your thumb (see our tip below!). Now do it one more time and voila! This easy-to-do rolled cuff is a major key to effortless summer outfits. And, it’s the perfect styling tip for relaxed fits like straight leg and boyfriend jeans. The trick to pulling off this look? Turn up the bottom of your jeans in half-inch rolls, and remember—the messier the better! Ready to try cuffing a new pair of jeans? Be sure to ask your Stylist for a pair of jeans in your next fix!